With Margareth Kammerer the form of the song is expressed through early blues, folk, sound research, experimental voice, and the “Lied”. Her minimal approach allows the texts and melodies to unfold without adhering to the structure often imposed or implied. M.K. began her musical activity in Bologna (Italy) where she studied at the D.A.M.S (Disciplines of Art, Music and Theater). 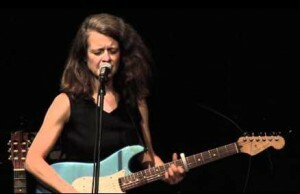 She co-founded several bands working with improvisation and collective composing. After moving to Berlin, she became involved in the experimental “Echtzeit” music scene, and has since developed her craft along many different lines, both with music and performance. Her solo work can be found on “To be an animal of real flesh” (Charizhma, 2004), and “Why is the sea so blue” (Mikroton, 2013). Other continuing projects include: The Magic I.D. (with Christoph Kurzmann, Kai Fagachinski, and Michael Thieke), The RubyRubyRuby (with Steve Heather and Derek Shirley), Mugglestone Revue (with Big Daddy Mugglestone), Secret Spirit House (with Ellen Fullman and Teresa Wong), etc. She has also worked with Chris Abrahams, Fred Frith, Luciano Chesa, Seby Ciurcina, Otomo Yoshihide, Paolo Angeli, Axel Dörner, Jason Forrest, Stefano Pilia, Andrea Belfi, Daniela Cattivelli, Claudio Rocchetti, the new contemporary music ensembles “Die Maulwerker” und “Ensemble Zwischentöne”, and many more. In theater, she has worked as actress/singer with Laurent Frechuret, (1999/2000, St. Etienne, Paris), Wolf Twiehaus (2001/2002, Schaubühne, Berlin), Berthold Schneider (2003, Staatsbank, Berlin), Jay Scheib (2002, Volksbühne, Berlin; 2005, Lamama Theatre, New York; 2006, Living Room, Bologna; 2009, Institute of Creative and Performing Arts at Colgate University), Adeline Rosenstein (2004-2008, Ausland, Berlin; 2009, Premieres Actes, France), Tone Avenstroup (2001, Reich und Berühmt Festival, Berlin; 2002, Lady Chutney, Vienna; 2002, Kunstnernes Hus, Oslo; 2001,Black Box, Oslo; 2012, Ackerstadtpalast, Berlin), Worm Winters (2002, Kunstnernes Hus, Oslo), Antonija Livingstone (2009, Performance Festival, Bologna) and Bo Wiget (2010, Fabriktheater Zürich; 2010, Sophiensäle, Berlin).